Variants | Variants: Stripes - We'll Be Back! 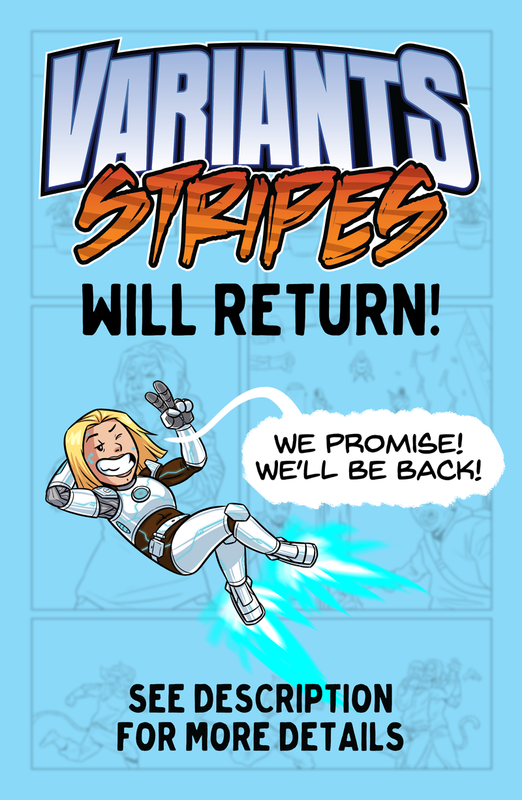 Variants: Stripes - We'll Be Back! As mentioned last week on Page 41, we're having to go on an indefinite hiatus. When will we be back? Right now we are unsure. Ultimately it depends on when our lead artist sells her house and manages to get settled in a new home. Make sure you follow us on social media to keep up to date with everything going on! Anyway! All that said, before we moved, I had a plan for myself where I'd get to Oregon, tell my freelance clients I was taking a couple months off to finish my comic, and then buckle down and finish the last 90 pages. I'm kind of an all-or-nothing personality y'know? But life being what it is, that plan didn't happen. Pretty much within a week of moving, I had a ton of freelance work offered to me and because I enjoy my freelance work, I accepted the gigs. So the comic got delayed. Time passed, more work came my way, the comic kept getting delayed. I've struggled with a ton of guilt over this because I know I made a promise that the comic would be back in 2018 and, well, here's 2019 and the comic is still not here. But at the end of the day, I don't regret how things went down. There's not much I could have changed in the past year. I made choices that I felt were in the best interest of myself and my family. Pausing the comic for a longer amount of time was one of those hard choices. So what does all of this mean? Well, this isn't meant to be an announcement saying that the comic is ending for good because it's not. But it isn't a "we're returning next week!" announcement either. It's more-so just and update of what's going on and why it's been so long. I love this story. I love these characters. I will see it not only finished but continued into the next book as well. When will this happen? I have...no clue. Soonish? Probably not. Eventually? Definitely. The support, love, and validation I've received from friends, fans, and family during all of this has been so uplifting to me. I appreciate y'all's patience so much, you have no idea. I know one day I'll be in that place where I can finally look at things and say "I can do this." and take that time to finish the book. In the meantime, I can only ask for your continued patience and encourage you to continue to support other LGBTQ+ comic creators out there while you're waiting for ours. Thank you again for your continued patience, support, and understanding. I refreshed this page quite a few times, but only now it occurred to me to scroll down, so I only just saw the new massage, haha. Take care and I'll continue reading when it continues! Good luck with evereything! That means a lot to all of us. No joke, your comment legitimately lightened my anxiety today. Sometimes us creators need to hear kind words like yours :) Thank you so much for being understanding and supportive! <3!